The Oppo R11 is due to be announced a week from now, and following render leaks, live shots and Oppo's own teaser, there seems to be little the company can surprise us with come June 11. Oh, and as if that wasn't enough, a GeekBench entry now reveals the R11's CPU performance numbers. The results aren't radically different from what a certain Heart-named device posted a couple of weeks back - in fact, the single-core's 1588 points are identical between the two. 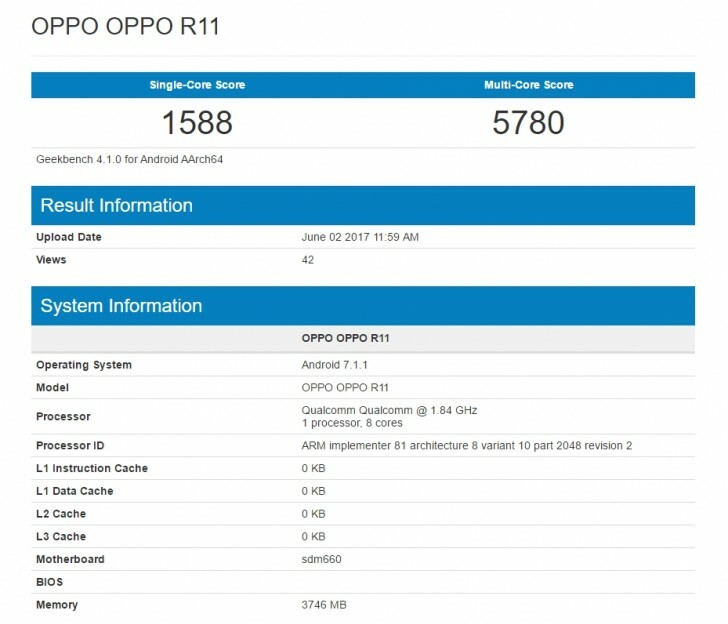 However, the Oppo R11 appears to be tweaked towards slightly higher multi-core performance, its 5780 points being some 6% more than the Heart's figures. It's splitting hairs, really, but the point is the Snapdragon 660, and consequently the Oppo R11, is plenty powerful. Other confirmed specs of the successor to the world's best selling Android smartphone for Q1 2016, the R9s, include a 5.5-inch FullHD AMOLED display, 16MPP+20MP dual camera setup, and a 2,900mAh battery. June 11 can't come soon enough. Scores more than 820 in multi core but still scores less in single core and GPU performance. Ultimately 820 is still the superior SoC.